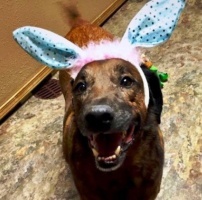 Are you looking for a sweet natured, happy-go-lucky, smart dog? Sam’s your man! Sam is such a good boy - a sweet 9 year old giver of love, and frivolity - in fact, this dog is SOOOO good, that he occasionally gets the chance to visit nursing homes and bring joy to the residents! Sam loves all humans, he is friendly, playful, gentle, affectionate, housebroken, used to being left alone inside the house, loves car rides and is fearful of fireworks. He knows sit, down, come, and shake. 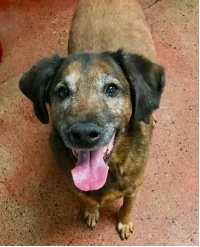 Sam needs a family of his own, while he looks forward to getting out for short visits with his senior human friends, its not like having your own family to love you. Sam does have a large mass (40cm x 20cm) that’s been diagnosed as lipoma (fatty tumor). Its his second, he had a 4" x 6" lipoma removed in 2017. 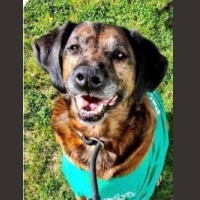 Given his age, the size of the mass, and recovery time, the shelter vet recommends not removing it and believes Sam should have a good couple of years of love, play, walks, naps, and being a best friend. We would like to bring him under LHDR and make sure that happens. We need a foster or forever home for Sam (no other dogs or cats please)! Who out there loves seniors?